Houghton Mifflin Harcourt, 2016. 32 pages. 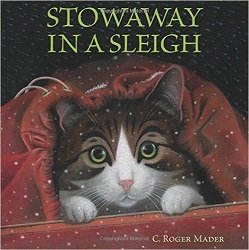 Here’s another new Christmas picture book that passed the hurdle of my approval. This one’s appropriate for very young kids, because there aren’t many words on each page, and the story is simple. The paintings are lovely, and bring you to a cat’s viewpoint. It was the darkest hour of night when Slipper heard strange footsteps in the house. When she goes to investigate, she finds Mr. Furry Boots! Kids will know this is Santa Claus. My favorite part is when Slipper does “exactly what any curious cat would do” — she climbs into Santa’s bag. 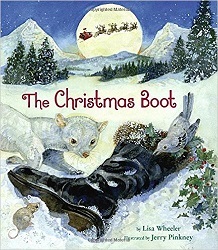 Santa unwittingly brings the cat back to the North Pole, where Mrs. Furry Boots lets the cat out of the bag. Slipper has a good time exploring Santa’s workshop, but when she starts longing for home, Santa makes a special trip to deliver her. The story is one kids can understand and empathize with, and much of it is told through the beautiful illustrations. I plan to remember this book for December story times next year. Dial Books for Young Readers, 2016. 32 pages. Here’s a wonderful new Christmas story. As the book opens, we see an older lady out in the snow. She has a hat, coat, and scarf, but her hands are bare. Deep in the forest on Christmas morning, Hannah Greyweather gathered bundles of kindling wood. For her, this day was no different from any other. As she went about her chores, she chatted to the forest, she talked to the mountains, but mostly she spoke to herself. Then Hannah sees a boot in the snow. And since her feet were fully freezing, and since it looked to be such a nice boot, she slipped her rag-wrapped left foot deep within it. It surely must have, for when she slid her tiny foot into the very large boot, it suddenly took on the shape and size of Hannah’s own foot. The boot fit perfectly. In the morning, a second boot is standing next to the first one. Hannah’s so happy, when she goes to gather wood, she makes snow angels. That night, Hannah placed her boots next to her bed and marveled at her good fortune. And in the morning, there are bright red mittens tucked inside the boots. Well, after her chores are finished, Hannah finds her wishes have indeed been granted, though these new ones don’t “fit” quite as well as the first wishes. But then a man in a red hat and red suit knocks on the door. He is wearing one black boot. Hannah knows where the boot came from now, and she gives it back. When she does, all her wished-for items disappear. But Santa knows how to make it right. This is such a lovely book, with very large pages and Jerry Pinkney’s colorful paintings. I especially like about it that Hannah isn’t greedy, and she has such a joyful spirit. She delights in the lovely warm things, but isn’t sad to give them up. And they help her realize that she doesn’t need much to be happy. So the reader leaves smiling when Santa makes her very modest wishes come true. With lots of words on each page, it’s appropriate for preschoolers who are good listeners and elementary school kids. Just a warm and wonderful new holiday story. Candlewick Press, 2016. 88 pages. Oh, how I love the Princess in Black! 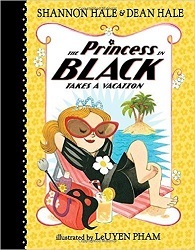 This is the fourth book about frilly and pink Princess Magnolia, who disguises herself as the Princess in Black to fight monsters with ninja moves. The Goat Avenger was the same height as her friend Duff. He even had the same smile. But it couldn’t be Duff. Duff did not wear a mask. The Princess in Black is tired. She has fought fifteen monsters this week. So the Goat Avenger offers to protect the goats while she takes a vacation. However, no sooner does Princess Magnolia start napping on the perfect beach, than a giant sea monster surfaces. Maybe if I just lie here the monster will go away, thought Princess Magnolia. The people on the beach screamed. Fortunately, Princess Magnolia has brought her disguise along with her beach gear. And fortunately, there’s a handy bathing tent where she can change. Can the Princess in Black save the day against a giant sea monster? And will she ever get a vacation? And can the Goat Avenger protect the goats from monsters? This series is just so much fun. I love the cartoon-like illustrations. The monsters are monstrous, but not too scary. The language is simple, perfect for beginning readers, but full of humor. I like the way the Princess in Black does use ninja moves (again my favorite is Twinkle Twinkle Little Smash! ), but she also tells the monsters to behave, and that they are not allowed to eat goats or people. Even though there’s a princess on the cover, these books are for kids of any gender. My co-worker’s five-year-old son loves them, as will any kid who likes superheroes or ninja moves or feeling powerful. You are currently browsing the Sonderbooks blog archives for December, 2016.